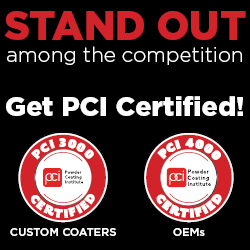 Register NOW for the PCI Custom Coater Forum being in conjuction with PCI Powder Coating 2019 Technical Conference in Orlando, FL. NOTE: This does not provide admission to the Powder Coating 2019 Technical Conference & Exhibition. You must register for those events in addition to the Custom Coater Forum. See the Combination Registrations available for discounts. Register: For complete information on the Custom Coater Forum and Powder Coating 2019 Technical Conference and to register, CLICK HERE.